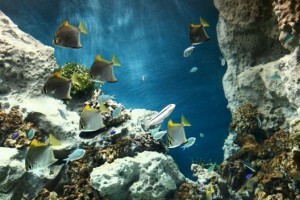 The Aquarium Livorno: a journey through nature and history, mythology and art. Aquarium of Livorno you can immerse yourself in a world where every learning experience is possible: a fascinating integrated edutainament in style, combining a visit to the display tanks with the “Kosmos: the sky and the stars of antiquity ‘Galileo “invented by Galileo Museum – Institute and Museum of the History of Science in Florence (by Giovanni Di Pasquale) and set up the first floor of the structure. The nature of the Mediterranean, the archaeological treasures of the Mediterranean. The masterpieces of art, scientific discoveries of the cultures on its banks have written history. If you seek a place where you can experience all this, welcome to the Aquarium of Livorno. Discover the new star of the Aquarium of Livorno: the green turtle and the wrasse!